The selection of appropriate type on maps, far from an arbitrary design decision, is an integral part of establishing the content and tone of the map. Typefaces have personalities, which contribute to the rhetorical message of the map. It is important to understand how to assess typefaces for their personalities, but also to understand which typefaces may be more or less legible in a labeling context. Beyond the choice of typeface, effective map labels will have a visual hierarchy and allow the user to easily associate labels to their features and feature types. The cartographer must understand and modify typographic visual variables to support both the hierarchy and label-feature associations. This entry was published on July 25, 2017. This Topic is also available in the following editions: DiBiase, D., DeMers, M., Johnson, A., Kemp, K., Luck, A. T., Plewe, B., and Wentz, E. (2006). Typography for cartography and visualization. The Geographic Information Science & Technology Body of Knowledge. Washington, DC: Association of American Geographers. (2nd Quarter 2016, first digital). typography: The design of text, characters and/or labels as a whole. label: A string of text that is a geographic feature name or description placed on a map. 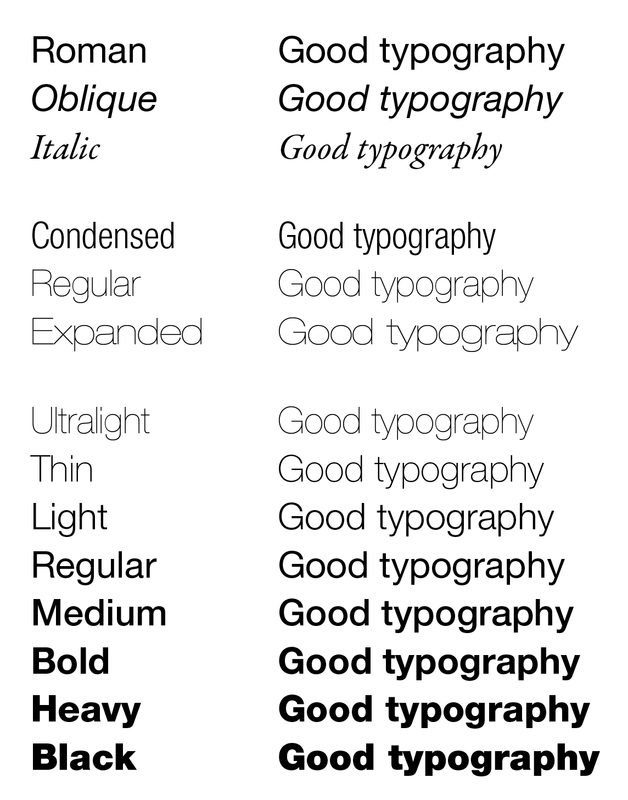 class: A group of typefaces with similar appearance related to their letterform structure and historical origin (Fig. 1). Figure 1. Classes are groups of typefaces with similar appearance related to their letterform structure and historical origin. posture: The distinction between roman (upright), italic (script-like slanted) and oblique (slanted) letters (Fig. 2). Italic and oblique are often considered to be synonymous, but they are not. True italics have their origin in cursive handwriting, and are usually designed as the counterpart to serif typefaces, whereas obliques are simply optically skewed letters, usually designed for sans serif typefaces. weight: The thickness or heaviness of the lines in a typeface. Weights usually range from hairline (i.e. very thin) to extra bold or black (i.e. very thick) (Fig. 2). compression: The variation in width of a set of typeface characters (Fig. 2). font: A particular posture, weight, and compression of a typeface. For example, Helvetica Neue Light Condensed Italic is a font within the Helvetica Neue typeface family. It has a posture (Italic), a weight (Light), and a compression (Condensed). The terms “typeface” and “font” are often used interchangeably. stroke: Each line and/or curve of a letter, based on how it would be drawn by hand. In Figure 3, the stem, leg, and bowl of the uppercase R are all strokes. serif: A style of typeface that has serifs, or “feet,” at the ends of its strokes. Serifs can appear as wedges, thin lines, or anything in between (Fig. 3). sans serif: A style of typeface without serifs at the ends of its strokes (Fig. 3). letterform element: Each individual “piece” of a letter, including strokes, serifs, and others. Elements are highlighted in blue in Figure 3.
microaesthetics: The variations in style, or presence/absence, of letterform elements from typeface to typeface (Fig. 5). baseline: The line on which non-curved portions of typeface characters sit. For optimum appearance, curved strokes usually extend just below the baseline and just above the cap height (Fig. 3). cap height: The height of the roman uppercase “H,” as measured from the baseline (Fig. 3). x-height: The height of the roman lowercase “x” of a typeface, as measured from the baseline (Fig. 3). kerning: The space between a single pair of characters (Fig. 3). point size: The size of a typeface. In physical typesetting processes (such as cast-metal printing), point size referred to the literal measure of the size of the metal piece from which the letter was carved. American printing standards designate 72 points to one inch. Point sizes of digital type (i.e, text on a web page) do not directly correspond to physical size. typographic visual variables: Directly modifiable aspects of the appearance of a label, such as kerning and point size (Fig. 6). Map typography has two major components: typefaces and labels. The typeface in which text appears on a map refers to the actual design of the letters themselves, which is not changeable (except by changing the entire typeface). Labels are strings of text placed on a map, and a cartographer has control over nearly every aspect of label placement and appearance. When designing maps, selecting a typeface may seem like an arbitrary or subjective exercise, and it may seem easy to accept the default typeface and label settings. However, illegible or stylistically incongruent typefaces and label design can make a map difficult to read, cause uncertainty for the reader, or engender misinterpretation of the map. These can have potentially serious ramifications. Your typography should be legible and support the map’s overall style and communication goals while avoiding visual ambiguity. Map labels are always set in a typeface (the default typeface if not explicitly changed). However, thousands of typefaces are available that vary widely in their design, from the simple to the embellished. There are two major categories of typefaces: text and display. Text faces, which generally have a simpler design, are suitable for books, blocks of text, and map labels. Display faces range from handwriting-style scripts to heavily themed or ornate designs. Display faces are not generally suitable for cartographic applications. When selecting a typeface for a map, its legibility, or the ability of the reader to distinguish characters from each other, is of primary importance. Assess both the point size of the label text and the design of letterform elements in the typeface (see Fig. 1). Even in smaller point sizes, faces with high x-heights that have clear and distinct letterform elements can be legible. On the other hand, some sans serif typefaces can be illegible no matter what size they are, as they create confusion between the capital I, lowercase L, and sometimes the number 1 (see Fig. 4). Small text becomes more difficult to read as a person ages, or with other visual impairments. Design your map typography for the lighting conditions and viewing distance of where and how the map will be displayed, whether in print or on a screen (see Map Production & Management, forthcoming). Very bright sunlight makes low-contrast text hard to read on a mobile device, for example. A map displayed on a wall by a projector seen from far away will need larger, simpler text than a high-resolution offset printed map. Even if you can read the labels, carefully consider if your audience can as well. Although you may not be able to control for all external variables controlling legibility, you can take steps to minimize illegibility through good design. Figure 4. Legibility challenges of serif and sans serif fonts with the letters I and L.
If you have ever seen a box (□), an inverted question mark (¿), or an unexpected string of characters (åŒ) appear in digital text, then you have witnessed a different breakdown in legibility. These are examples of replacement characters substituted by software applications when they do not recognize a character or diacritic (i.e., a special language marking), and can make text difficult to understand. Such gibberish symbols can be avoided by selecting a typeface that contains the proper character sets for all labels in the map. Most Western text faces cover at least the 256-character Windows-1252 character set, a standard set that contains the Latin alphabet (upper- and lower-case A-Z, and some accented variants), numerals, and basic punctuation. However, languages that use non-Western alphabets or ideographs (such as Arabic, Cherokee, Cyrillic, Hebrew, and East- and South-Asian languages, among others) may require additional or different typefaces. Empirical evidence has shown that typefaces have distinct personalities (Brumberger, 2003; Lewis & Walker, 1989), also called a “semantic effect” (Childers & Jass, 2002). This is the impression that a viewer has of the typeface. For example, the typeface Lobster suggests whimsicality or casualness. By contrast, the typeface Open Sans can appear sober and straightforward. In cartography, while the semantic effect of a typeface may not be immediately noticeable, it often affects the way text is read and understood (Larson, Hazlett, Chaparro, & Picard, 2007) and can influence a viewer’s impression of a map. In other words, typeface choice is a form of branding, and a typeface can unwittingly brand a map in a way its designer did not intend (see Woodward, 1982). For example, a map that depicts legal designations of property lines and areas should not be labeled with a typeface that is overly friendly, such as Cabin, or thematic, such as Orbitron. Finally, it may be tempting for designers to think that neutral typefaces exist devoid of all possible semantic associations. However, because design is an act done by humans working in a particular place and time, it is neither neutral nor value-free (see Aesthetics & Design, forthcoming). Typefaces are designed products, and thus are shaped by cultural influences (Kinross, 2002), even if they appear to be neutral. Typefaces designed in the mid-1900s, such as Univers, were intended to be neutral, but now connote a mid-century Swiss design philosophy focused on grids and order. So how do cartographers evaluate semantic effect and suitability? A first step involves understanding the basic typeface classes and the purpose and intent of the map being designed. For example, historically faithful venetian typefaces that resemble those used in 15th-century printing presses (see Fig. 1) may not be appropriate for a reference map in a news article. Similarly, a contemporary sans serif typeface would look out of place on a map created in the style of an ornately engraved 18th-century atlas. Typeface appearance can vary widely within a class, so it is also important to consider the smaller details of typeface design (see Fig. 1). These details, called microaesthetics, are the variations of individual letterform elements (Kunz, 2000). Figure 5 shows a list of a few visually important letterform elements, their common variations, and their possible associated semantic effects (for more background, see Henderson, Giese, & Cote, 2004; Mackiewicz, 2005; Perfect & Rookledge, 1983). For example, the curved tail of an uppercase J may have a ball on the end or taper to a point, and the tapered J tail is more associated with one semantic effect than another. Typefaces exhibit nearly limitless microaesthetics, as they are only limited by the imagination of the designer. Understanding how to identify microaesthetics and compare them between typefaces can help cartographers select appropriate typefaces. However, there is no right or wrong way to judge a microaesthetic, and no authority exists on what particular microaesthetics contribute to semantic effects. When designing map labels, it is often useful to examine multiple letters or a block of text as a whole, in addition to individual letters and elements. For maps that require an array of labels and feature types, using more than one typeface may be appropriate. However, as paired typefaces can often clash, it is important to select faces that do not detract from a map’s intent. Visual harmony can be improved if two (or more) faces relate to, but are visually distinct from, each other; meaning that they have similar letterform structures, and similar semantic effects, but are not in the same class (see Fig. 1). As a general guideline, pair sans serif faces with serif ones, as serif faces are traditionally used on maps for hydrologic features, and sans serif for cultural or anthropogenic features. Choose faces with similar x-heights and cap heights. Beyond that, try to pair typefaces that share the same design era. For example, contemporary typefaces that were both designed in the current decade often appear more visually pleasing together than would a neo-grotesque from 1850 with a garalde from 1650 (see Fig. 1). A cartographer’s ability to choose typefaces varies by map publisher. Often, companies or agencies set labeling styles as part of their established visual identity, and do not permit any deviation. In other cases, map designers may be constrained to choosing only typefaces that are included in a given operating system, or they may have free reign to use any typeface they can purchase or download. Typeface piracy violates copyright law, and deprives typeface designers of income for their creative work. If purchasing a typeface is not possible, consider using and citing a free and open-source typeface by a recognized designer or company. Many free fonts are available that are suitable for professional cartographic applications. A popular resource is Google Fonts, and the typefaces available there can be used as webfonts or installed on a computer. Use careful judgment when selecting a free typeface, as they are sometimes ill-designed or contain only a very limited set of characters. It is good practice to choose typefaces that have roman, italic (or oblique), bold, and bold italic fonts. Typefaces with multiple weights (light, medium, heavy) or with serif and sans serif variants will lend even more flexibility to the designer. Digital maps rarely stand alone and are nearly always contained or presented in an interface (see User Interface and User Experience (UI/UX) Design). These interfaces or viewers are essentially part of the map, as they provide the tools to navigate and interact with the map. The concept of semantic effect can be extended from the map to the interface, and attention should be paid to the design and typography of the interface to permit a consistent and pleasant user experience. When creating the interface for the map, consider using typography that matches that of the map; if that is not possible, use a typeface that is easily read at low resolutions like 72 ppi, an older display resolution standard for monitors. Moreover, online users will have a wide range of operating systems and browsers. For text that will be rendered natively by the browser, aim for web-safe fonts. These are typefaces supported by all major browsers or have an easily substituted version. 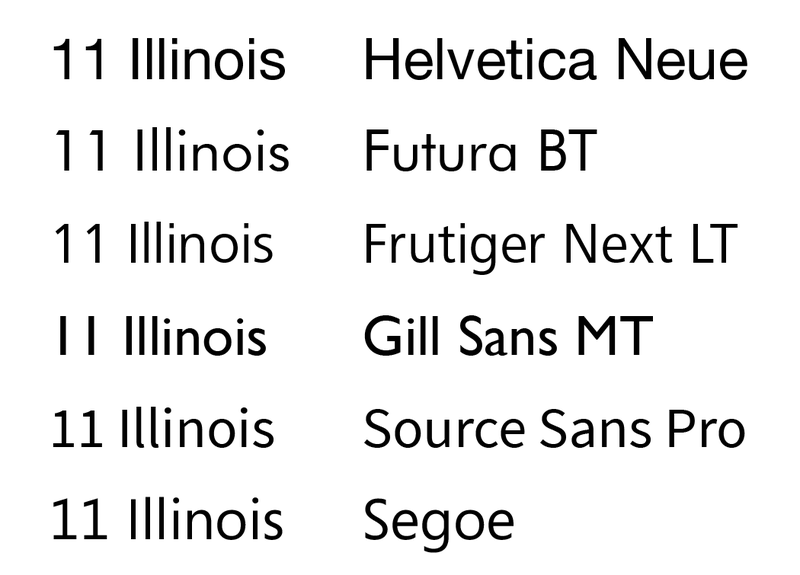 These are Arial/Helvetica, Times New Roman/Times, Courier New/Courier, Verdana, and Georgia. If you have access to a service such as Typekit, which serves up the typeface of your choosing, then you have more options, but keep in mind the relationship between the interface typography and the map typography. They should support each other and maintain the brand of both the map and the agency or company that created the map. In a GIS, labels are generated from a field or attribute in the feature’s attribute table. You may need to edit the field to ensure that labels are spelled correctly, are abbreviated correctly, or have the correct case (see Fig. 6). Authoritative spellings for geographic features can usually be found on the website or geoportal of your country’s national mapping organization. In the United States, the Board on Geographic Names is the authority on feature names. In a typographic context, visual variables stand in contrast to microaesthetics, as microaesthetics are not modifiable (see Symbolization & the Visual Variables). In other words, a designer can choose a different typeface, but cannot remove or adjust its letterform elements (see Fig. 5). Label properties are visual variables, and can be changed judiciously to elegantly and clearly label a map. Figure 6 shows some typographic visual variables. Along with typeface legibility, label legibility is another important aspect of map design. Viewed by themselves, typeface letters might be individually distinguishable, but they still must remain legible when placed over cartographic features such as contours and road networks, shaded relief, land cover/land use information, and other imagery. One approach to increasing type legibility is to use halos, which are thick outlines behind label text can that prevent visual interference between the map background and its labels (see Fig. 7, “Lake Street”). However, care should be taken with using and adjusting the size of halos; when too large, they can resemble cartoon-like blobs. Another option is to use masks, which break map features around a label (see Fig. 7, “400”). Masks are particularly effective for labels that are placed on top of line features. Much like for cartographic features, establishing a visual hierarchy of labels can increase their legibility and make interpretation easier for the map reader (see Visual Hierarchy, Layout, & Map Elements). A clear label hierarchy helps establish the relative importance of map features and areas. For example, important cartographic features should have prominent labels, as they make these features easier for viewers to discern. Labels can be finely balanced in a hierarchy by combining various label properties. For example, labels for broad areas can be set in a large point size to indicate the area covered, but also fade into the background (be lower in the visual hierarchy) with reduced contrast. Point size. Larger labels are generally viewed as more important in a hierarchy than smaller ones. Tracking/Spacing/Leading. A label with wider or looser tracking, spacing, or leading settings covers more space than labels with smaller or narrower settings. The extended space covered by the label can lend it a larger visual presence, but can be easily lowered in the hierarchy by modifying its contrast. Weight. Heavier weights will be higher in the visual hierarchy than lighter weights. Compression. Extended text appears more prominent than condensed text. Case. All capital letters will be higher in the visual hierarchy, but judicious use of small caps can help push labels that are too prominent into the background.Value/Contrast. A lower contrast between a label and a map background makes labels appear less visually prominent, which places them lower in a hierarchy. Contrast is changed by modifying the value of text. Establishing a map label hierarchy also creates a more prominent visual association between labels and their features. For example, if all labels on a map were to appear in the same typeface, size, and color, viewers might have difficulty associating labels with their corresponding features. One of the easiest ways to introduce meaningful label variation is to use two paired typefaces, such as serif and sans serif, to distinguish different categories of features (see Section 3.4). Label hierarchies within feature categories can then be established as listed above. Other typographic visual variables create label-feature associations rather than hierarchy. Cartographers often use the same or similar hues for labels and features, and change the value or add halos/masks as necessary to ensure legibility. A forest polygon symbolized with a light or partially transparent green overlay could be labeled in dark green, or in a different hue with a light green halo. Posture is often used to distinguish wholly different feature types, such as using only italic/oblique for hydrography. Label-feature association can be improved for area features by adjusting typeface tracking and leading to ensure that the label is visibly spread over the feature. For areas at smaller scales, or for point features, tightening the leading for multi-line labels can reduce ambiguity, as lines that are too far apart may be read as two separate labels. Optimum label density will be determined by the purpose, audience, and format of the map. A poster-sized printed reference map can and should have a higher label density than a map used for driving navigation on a smartphone. Low label density allows map features to stand out in general, and pushes labeled features to the top of the visual hierarchy. High label density shifts the visual focus from the map to the labels, and can make visual search difficult. It is not necessarily bad, but care must be taken when using many labels to set up the label hierarchy and ensure legibility. Prioritize labels by setting up a label hierarchy based on feature attributes. For example, cities with relatively higher populations can be set to have a higher label priority, so that labels for smaller cities will not be placed if they do not fit comfortably on a map. Remove entire label classes. If users are able to zoom to a larger scale that allows more labels to appear, consider leaving out labels for particular features at smaller scales. Remove entire feature classes. For example, a map at 1:500,000-scale may not need to display very small lakes (or their labels). Decrease the point size, but avoid reductions beyond legibility limits (see Section 3.1). Label placement is the final important aspect of map typography, as good placement reduces ambiguity. You are encouraged to start with automatic labeling and adjust the placement settings before turning labels into annotation (static text) and modifying individual labels by hand. For large maps with extensive spatial coverage, annotation may not be feasible at all. You will need to identify how much error or inconsistency is acceptable, and balance that against the effort needed to manually change labels. If you are designing at multiple scales, be aware that label settings may not translate well between scales (see Scale & Generalization). Using large-scale label settings at small scales will result in excessive label density or labels that cover too much area. You may also need to adjust your visual hierarchy as features are generalized through scale. Keep labels as close to their features as possible without overlapping or occluding other features. If there is any visual interference between a label and the features beneath it, use halos or masks (see Section 4.2). When mapping coastal regions, labels of cities on the shoreline should be placed in the ocean. If manual adjustment of point or line labels is necessary, remember to maintain a consistent distance between each feature and its label. Repeat labels along long line features or within large areas. This is particularly important for digital maps that can be panned and zoomed, in which much of a feature can lie outside of the viewing area. Do not force the reader to search for a label. Use leader lines sparingly, if at all. Excessive lines will clutter the map. Place labels or redesign symbols such that the feature symbols do not appear as part of the text. For example, round point symbols can often appear as the letter “o,” and as part of a label. Avoid placing labels directly between point features. If it must be done, label fewer points and force labels into consistent directional zones (i.e. to the northeast, southeast, northwest, and southwest). Avoid placing labels upside down along lines. Consider extending labels along lines to indicate feature length. However, be mindful of stretching labels too far along line features, as too much space between words or characters may make it difficult for viewers to trace complete labels. Use multi-line labels for line features only when absolutely necessary (although street grids are often an exception). If possible, control the level of curvature of labels. Labels with curved baselines that follow the shape of features are especially useful and pleasing for stream and river features, but too much curvature or too many sharp curves can cause letters to overlap. Consider increasing label tracking and leading attributes to indicate the extent of the feature. If a label is too prominent, it can always be lightened to appear lower in the visual hierarchy of your labeling system. Curved or slanted area labels can be difficult to read, so use only very slight curves if necessary. You may wish to consider consulting cartography textbooks (Brewer, 2016; Slocum, McMaster, Kessler, & Howard, 2009) for further instruction and suggestions regarding label placement. Brewer, C. A. (2016). Designing better maps (2nd ed.). Redlands, CA: ESRI Press. Brumberger, E. (2003). The rhetoric of typography: the persona of typeface and text. Applied Research, 50(2), 206-223. Casti, E. (2005). Towards a theory of interpretation: Cartographic semiosis. Cartographica, 40(3), 1-16. Henderson, P. W., Giese, J. L., & Cote, J. A. (2004). Impression management using typeface design. Journal of Marketing, 68(4), 60-72. Kinross, R. (2002). Universal faces, ideal characters. In Unjustified Texts (pp. 233-245). Hyphen Press. Kunz, W. (2000). Typography: Macro and microaesthetics. Sulgen, Switzerland: Arthur Niggli. Mackiewicz, J. O. (2005). 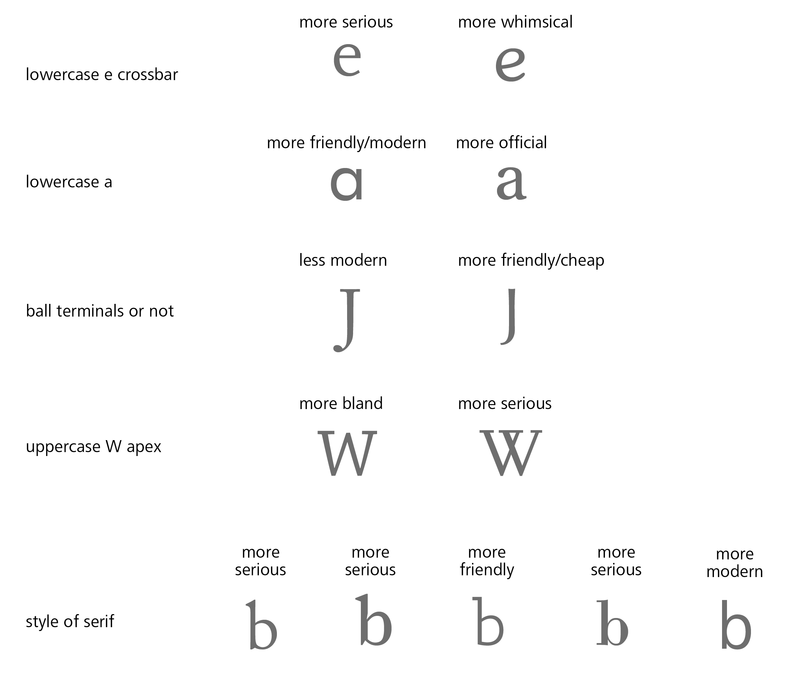 How to use five letterforms to gauge a typeface’s personality: a research-driven method. Journal of Technical Writing and Communication, 35(3), 291-315. Perfect, C., & Rookledge, G. (1983). Rookledge’s international type-finder. London, UK: Sarema Press. Slocum, T., McMaster, R., Kessler, F., & Howard, H. (2009). Thematic cartography and geographic visualization (3rd ed.). Upper Saddle River, NJ: Prentice Hall. Wood, D. (2010). Rethinking the power of maps. New York, NY: The Guilford Press. Woodward, D. (1982). Map design and the national consciousness: typography and the look of topographic maps. In Technical Papers of the 42nd Annual Meeting of the American Congress on Surveying and Mapping (pp. 339-347). Denver, CO: American Congress on Surveying and Mapping. Define the terms typeface and label. Explain the difference between typeface properties (microaesthetics) and label properties (visual variables). 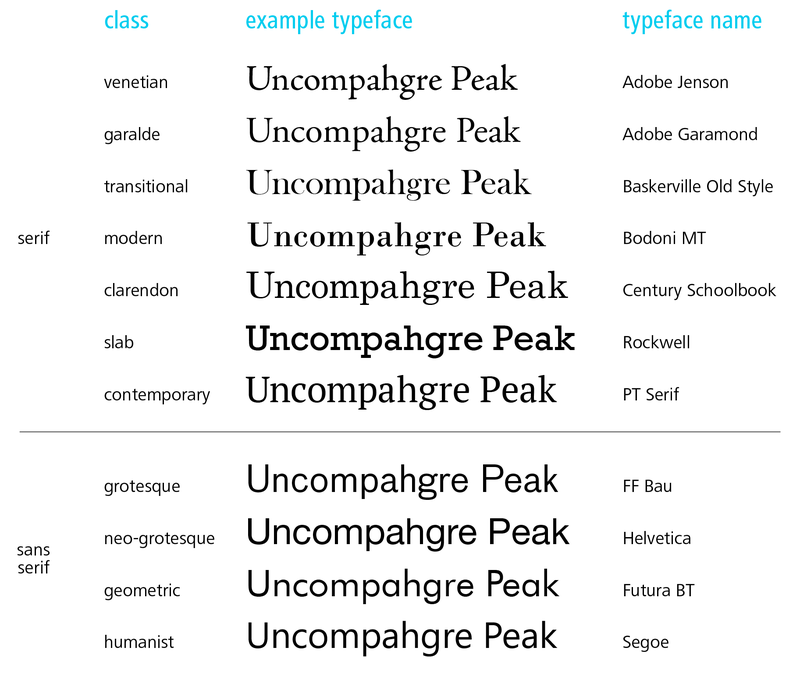 Differentiate between the components of a font: typeface, weight, compression, and posture. Identify personalities of typefaces, and the microaesthetics that contribute to them. Modify typographic visual variables to graphically represent the type and attributes of geographic feature. Explain how to label features having indeterminate boundaries (e.g., canyons, oceans). Critique a typeface for a given map, analyzing what is appropriate and/or inappropriate about it. Implement techniques to improve typeface and label legibility, and to disambiguate labels. Adjust label properties to create an appropriate label hierarchy. Why is typography an important part of cartography? Given a suggested typeface, would you be able to deem it appropriate or inappropriate for a particular map project? Suggest three different typefaces for labeling these maps: a cadastral map used by the municipal government, ski slopes in a resort, a simple graphic to appear on a television news program. How would you create a label hierarchy with a severely limited color palette (for example, grayscale only)? What factors enhance or limit both typeface and label legibility? How would you recast a map’s rhetoric from “casual” to “authoritative” using only typographic visual variables? Bartram, A. (2007). Typeforms: a history. London: Oak Knoll Press. Brewer, C.A. (2008). Designed maps: A sourcebook for GIS users. Redlands, CA: ESRI Press. Coles, S. (2012). The anatomy of type: a graphic guide to 100 typefaces. New York: Harper Design. de Jong, C. W., Purvis, A., & Tholenaar, J. (2013). Type. A visual history of typefaces and graphic styles. New York: Taschen. Franz, L. (2012). Typographic web design: how to think like a typographer in HTML and CSS. Chichester, UK: Wiley. Garfield, S. (2012). Just my type: A book about fonts. New York: Penguin Group (USA). Harley, J. B. (2001). The new nature of maps. (P. Laxton, Ed.). Baltimore, MD: The Johns Hopkins University Press. Hochuli, J. (2008). Detail in typography. London: Hyphen Press. Jubert, R. (2006). Typography and graphic design: From antiquity to the present. (D. Dusinberre & D. Radzinowicz, Trans.). Paris: Flammarion. Lupton, E. (2010). Thinking with type: A critical guide for designers, writers, editors, and students (2nd ed.). New York: Princeton Architectural Press. Noordzij, G. (2005). The stroke: Theory of writing. London: Hyphen Press.